The Tangled Web Icke Weaves: Who is Behind David Icke’s Freedom Foundation? Since then Icke has managed to attract ridicule from his fellow conspiracists, most notably when he launched into his reptilian thesis all guns blazing, convinced that he alone had happened onto the truth. The “biggest crock to be foisted on the public in many moons,” declared an incredulous Jim Keith, after reading Icke’s magnum opus on the reptilians, The Biggest Secret (1999).Despite some testiness, Icke insists such criticism has been water off a duck’s back. Such defenses are definitely an asset as Icke continues to feed perceptions that his judgment is suspect. Mid-way through 2006, Icke announced on his website that he was forced to take legal action against long-time collaborator Royal Adams, who had taken control of all his writings. This was an ironic turn of events, given that Icke had dedicated his most recent book, Infinite Love is the Only Truth, Everything Else is Illusion (2006), to Royal Adams for his “magnificent work” in keeping his books “in circulation.” Icke had also dedicated The Biggest Secret, “to Royal, for all his great work in America.” To have misjudged the trustworthiness of a close collaborator for so long is quite a feat, but in his efforts to deal with this thorny legal issue Icke seems to have made another blunder. Numerous researchers drew on that report and the book, Foundations: Their Power and Influence (1958), written by the Committee’s general counsel, Rene Wormser, to conclude that such foundations were a problem. John A. Stormer’s path-breaking None Dare Call It Treason (1964), for example, devoted an entire chapter to explaining how “the money of American capitalists—Ford, Rockefeller, Carnegie, Guggenheim, etc.—has largely financed those working for the establishment of a ‘new world order’” (Stormer, 173). Icke, though, appears to have given the IHC his seal of approval. Given his record of opposing the Illuminati, most supporters would be confident that the IHC meets David Icke’s exacting standards. Nevertheless, in lieu of any detailed explanation from Icke assuring us of its suitability, it is surely prudent to ask some questions about the IHC. What are its objectives? Who runs it? What does it do? Where does it get its funding? According to its recently issued Operations Manual, the IHC was established in 1988 as a “fiscal sponsorship program that deploys education, services and ecologically responsible technologies to the benefit of the general public.” The primary function of the IHC is to provide financial and administrative services to “grassroots projects.” As a 501[c](3) non-profit public charity, donors can be sure of retaining their tax-exempt status when they give money to a specific project via the IHC. In return, the IHC levies a “Minimum Annual Fee” of either $200, or 5% of the donations received by a member, whichever is larger. Looking closer, one discovers a few interesting facts that should have piqued the interest of an analyst of Icke’s calibre. The IHC’s Financial Director, Catherine Carroll, was a co-founding director of the Renaissance Foundation, a “leadership organisation,” according to its website. One of its sub-programs is the “Renaissance Women” a group “whose goal is to give women an alternative voice from radical feminism.” Back in 2000 this was realised as “support for George W. Bush,” though we were assured this support was not given as a collective, but as “individuals” (WorldNetDaily, Aug. 2, 2000). Board member Katherine O’Flahtery was once a trouble-shooter for Wal-Mart logistics. The IHC Operations Director, Dave Sanders, before going green fifteen years ago, spent seventeen years as a contractor for the U.S. Department of Energy, the U.S. Department of Defense and GE-Nuclear. IHC Executive Director Steve Sugarman, a professional psychologist, was a former Executive Director of the Social and Environmental Entrepreneurs (SEE), Co-Founder of the Bolsa Chica Stewardship Group, and author of The Blueprint for Planetary Evolution. Prepared partly as a response to the events of 9/11, Blueprint is a “holistic picture” of the “fronts of the ecosocial movement … in the context of the present world situation.” That present world situation Sugarman presents as a “catastrophe,” the “sixth extinction crisis” to have hit the Earth; though, in this case, it is “altogether human-caused, and happening at a phenomenal pace.” Sugarman’s solution to this crisis is to embrace the values of “Deep Ecology,” which in practice means creating a “bioregional” society by breaking up cities into “ecovillages.” In this “ecosocial” utopia of “planned communities” the global economy would be supplanted by “regional economies.” Many international institutions, such as the WTO and IMF, would become defunct and the multi-national corporations would be broken down into local entities. For people who like to throw themselves, or sharp objects, at the barricades that surround most Group of Eight meetings, this “ecosocial” agenda would seem familiar and admirable. Reader’s of Icke’s collected works would also note some similarities: not long ago Icke had entranced readers with his account of the conspiracy hatched by a “Luciferian consciousness.” He offered his solution of “World Cooperation” in which national governments would be eliminated and replaced by a hierarchy of organisations: neighbourhood councils, community councils, community forums, regional governments and finally a “world forum” (Icke, 1994, 276-78). Only eighteen years ago, during his salad days as the national spokesman for the UK Green Party, Icke advocated breaking up the multi-national corporations into “smaller, less powerful units on at least a national and ideally a regional basis” (Icke, 1989, 80-81). Perhaps the least palatable aspect of Sugarman’s vision is his grim advice on the global population problem. According to Sugarman, a “decrease in global human population is absolutely necessary.” He noted that Thomas Malthus’ warnings about the dangers of overpopulation are “proving to be correct” with “[w]ar, hunger, disease and ecological devastation … the order of the day.” Exactly how this problem is to be resolved, Sugarman does not say, but he insists that a “conscious effort to stabilize the current level of human saturation is necessary,” after which a “steady decrease can be implemented.” Of course, Sugarman warns that he is “not suggesting this will be easy” and is unlikely to be popular, but it must be dealt with. Once again humankind has a choice to make. We can be sensible and limit our numbers voluntarily or we can go on until nature does it for us with disease and hunger. That will be deeply unpleasant for those around at the time…and the time isn’t too far off (Icke, 1990, 87). It is plainly true, as the New World Order promoters say, that there is a limit to the number of human beings who can live on this planet. You can’t argue with that because when there is a humanbeing for every square foot of the Earth, there will be clearly too many. (Icke, 1997, 165). On its website, the IHC makes clear that, “Once your project is reviewed and deemed in alignment with our charter…” support will be provided. Well, Icke’s project was deemed “in alignment” and they’re now helping him out. Before joining the IHC, Sugarman was Executive Director of Social & Environmental Entrepreneurs. Like the IHC, SEE is a “public charity” that provides start-up guidance and other services to its member groups. SEE describes its mission as being to “empower, encourage and catalyze individuals to facilitate progressive change in areas of social justice and ecological restoration.” The SEE Program was created in September 1994 by the EarthWays Foundation as an affiliate organisation. The Earthways Foundation was established in 1988 by Andrew Beath, a successful corporate real-estate developer, who turned his attention to social justice and environmental philanthropy some twenty years ago. Beath is currently Executive Director of both EarthWays and the SEE. The objective of EarthWays, according to Beath’s letter on its website, is to “find a deeper understanding of our relationship to the natural world,” and to “restore an appropriate balance” between our economic needs and the environment. At EarthWays, “We are crying for a vision that all living things can share,” claims Beath. “From this inward crying,” he continues, “comes personal awareness that gives direction to our desire to take action. Personal transformation is the first step to global change.” Readers who find these sentiments similar to Icke’s metaphysical ramblings can presumably find more insights in Beath’s book, Consciousness in Action. In 1998, EarthWays received $50,000 from the Rockefeller Foundation for its role as an organizing partner of the 1999 World Festival of Sacred Music—an event billed by its organizers as a way to “transcend borders of all kinds—linguistic, national, cultural, ideological, racial and religious.” The Rockefeller Foundation gave EarthWays a further $42,837 in 2000 to film the festival; and in 2002 it granted EarthWays $100,000 to help with the costs for the 2002 World Festival of Sacred Music. Additional funds came from Rockefeller Philanthropy Advisors, which donated “$10,000 or more” to EarthWays between 2002 and 2004 (RPA, 2005, 16-17). As for the SEE, which granted the IHC $338,689 in 2003 and $143,568 in 2004, where its funds ultimately come from is unknown, and few of its member groups bother to include details of their sponsors. However, among the plethora of seemingly fringe environmental and social justice projects it counts as members, the SEE provides support to groups with strong Establishment connections. Consider the Truman Security Forum (TSF), an organisation that describes itself as a “non-partisan, national security institute dedicated to creating a strong principled alternative to conservative national security policies.” The Executive Director of the TSF is Rachel Kleinfeld, a Rhodes scholar and former consultant to the Centre for Strategic and International Studies (CSIS), and member of the Board of Trustees of the Blue Fund, a body dedicated to securing corporate support for the Democrats. On the TSF’s seven-member Board of Advisers we find former Council on Foreign Relations (CFR) President Leslie Gelb, former Secretary of State, Madeline Albright, and former Secretary of Defense, William Perry. Icke has previously denounced the Rockefeller family as “reptilian full-bloods” (Icke, 1999, 45) and the “bloodline branch managers in America … who, quite provably, decide who is going to be President” (ibid, 190). Icke is also on record describing the Rockefeller Foundation as a “tax-exempt New World Order front” (Icke, 1997, 133), as well as claiming that it set CIA policy (ibid, 285), and has funded research into computers that can control the human mind (ibid, 374). Icke warned that the Rockefeller Foundation is part of an “endless web of interconnecting groups” that interlocks with the Illuminati and other sinister organisations (1999, 263). In fact, the Rockefeller Brothers Fund, the Rockefeller Foundation, the Rockefeller Family Fund and the Rockefeller-connected Mellon Foundations “poured millions into the environmental campaigns and pressure groups” to create the modern green movement (Icke, 1997, 243). According to Icke, Rhodes Scholars, such as Kleinfeld, are “selected by the Brotherhood,” in accordance with their “genetic history,” to be “indoctrinated into the ‘world government’ Agenda.” Icke notes that most Rhodes Scholars “return to their own countries and enter positions of overt or covert power” (Icke, 1999, 218). TSF Advisor Madeline Albright is a “Brotherhood initiate” and the “High Priestess of U.S. politics” who “knows about the U.S. government mind-controlled slaves and supports that policy” (Icke, 1999, 340). Her colleague, Leslie Gelb, is easily condemned given that the CFR controls U.S. foreign policy, and its goal is “to introduce world government” (Icke, 1997, 85). Secretary of Defense, William Perry, whom Icke identifies as a Bilderberger (Icke, 1999, 267), belongs to a secretive organisation that is part of “a highly effective network of manipulation which comprises a very significant element of the secret government of the world” (Icke, 1997, 138). Another donor of interest on the IHC’s 990 Form for 2005 is the Tides Foundation, which donated $55,000. According to its own records, the Tides Foundation actually gave nearly $90,000 in grants to three IHC members: $20,000 to the Coalition Against Militarism in Our Schools; $64,000 to Voter Action; and $3,700 to WildPlaces. Tides allows donors to anonymously contribute money to a variety of causes—and thereby avoid public accountability for their donations. The donor simply makes the check out to Tides and instructs the Foundation where to forward the money. Tides does so, often keeping as much as ten percent of the total amount for “charitable advisory fees.” This allows high-profile individuals to fund extremist organizations by “laundering” their money through Tides, leaving no paper trail (Johnson 2004). The San Francisco Bay Guardian made a similar observation in a 1997 article: “Wealthy patrons give big chunks of money to Tides—and their names are kept confidential. The Tides donation is completely tax deductible. But the donor can discreetly designate an organization that he or she wants to see receive the money—and Tides will pass the donation along, minus a small administrative fee. Often, the recipient group doesn’t know where the money really came from. And there’s no way for the public to find out either (Cohen 2006, 2). A look at the top funders of the Tides Foundation gives a sense of this. According to Activist Cash, the top funder was the Pew Charitable Trust, which provided Tides with $118 million between 1990 and 2002. Other key Establishment foundations also contributed: the Ford Foundation provided $36 million between 1989 and 2005; George Soros’ Open Society Institute donated $15.7 million (1997-2003); the Rockefeller Foundation gave $2.9 million (1993-2002); $2.3 million from the Carnegie Corporation (1992-2002); the Rockefeller Brothers Fund gave $1.9 million in 1993-2003, plus a further $250,000 in 2005; Rockefeller Philanthropy Advisers gave $372,300 (1997-2001) and the Rockefeller Family Fund donated $175,000 (1991-2001). Tides also received some $6 million from Heinz Endowments, the foundation run by Teresa Heinz Kerry, the wife of Senator John Kerry, the Skull & Bones man who ran against George W. Bush in 2004. Tides has used this money to help fund a variety of organisations, ranging from violent anarchists such as the Ruckus Society, to the Council for American Islamic Relations, the Union of Concerned Scientists, Greenpeace, and now three projects under the wing of the International Humanities Center. Any reader of David Icke’s books would know the origins of the Tides Foundation’s money alone would make it a suspect institution. Most of these foundations, claims Icke, form part of the “network of so-called tax-exempt foundations started by the Carnegie, Rockefeller, and Ford families, which help to fund the New World Order plan” (Icke, 1997, 67). To make matters more interesting, sitting on the Tides Foundation’s Board of Directors is Joanie Bronfman. Bronfman has devoted a lot of time to convincing the wealthy that being rich can be positive experience. The Tides Foundation website notes that Joanie Bronfman had previously “served on the boards of Tides Canada and the Threshold Foundation, where she was a founder of Threshold’s Social Justice Committee.” Tides Canada has made its contribution to our future by distributing copies of Al Gore’s doom-laden presentation on global warming, An Inconvenient Truth, to schools in Canada. All of this would seem to be a trivial matter, except that David Icke has repeatedly attacked the Bronfman family of Canada, the founders of the same Seagrams liquor company, as respectively: an “underworld family” (Icke 1997, 290); “a reptilian bloodline and very close to the Rothschilds” (Icke, 2001, 387); one of the Illuminati’s “key bloodlines” (Icke, 2001, 410); and as the “Illuminati Bronfman family” (Icke, 2003, 411). More significantly Icke has claimed that it was “the Bronfmans, through various front organizations and stooges,” who were behind a global campaign to suppress his books and speaking tours (Icke 2001, 387). But now he has teamed up with an organization that receives money from a foundation with a Bronfman on its board. David Icke is not the first researcher to warn of the insidious influence of the tax-exempt foundations. The pioneering work on this issue was done by the Reece Committee in the 1950s and brought to a larger audience from the 1960s onward by a diverse range of authors including, Kent and Phoebe Courtney (1962, 19-26); Allan Stang (1968, 115-123); William P. Hoar (1984, 74); Gurudas (1996, 21-22); and Jim Marrs (2000, 53). Researchers, such as Bob Feldman and Left Gatekeepers.com, have established links between the leading foundations and environmentalist / progressive movements in the U.S., from The Nation to Noam Chomsky. Icke must be the first of the much-maligned members of the conspiracist camp, if not one of its most radical thinkers, to actually go from attacking that network to joining it. The question for Icke’s many admirers is why has this happened? It would be tempting to attribute this to an oversight on his part, perhaps attributable to the stress of his recent court case; except that this is not the first time Icke has worked with the IHC. In 2004, there was the David Icke/Metta Arts project, the funding of which was controlled by the IHC. It is alleged by one source that Icke was informed by one of his concerned fans that the IHC had a Rockefeller connection. In response, Icke reportedly insisted that the connection was of little consequence and that he was not longer dealing with the IHC. If true, this alleged dismissal of the IHC’s Rockefeller connection by Icke would be heartening to all those individuals Icke has smeared over the years due to their supposed links to the Illuminati. For example, Icke’s long-time antagonist, Richard Warman, was once maligned as a Bronfman “stooge” because he was a member of the Ontario Green Party of Toronto, “one of the global centres of the Illuminati and one of its key bloodlines, the Bronfmans.” According to Icke, Warman worked closely with the Canadian Jewish Congress, which was “founded and funded by the Bronfman family” (Icke, 2001, 410. 411). Not surprisingly, Warman took legal action against Icke, the results of which have gone unreported. This leaves open other, less palatable explanations for Icke’s current arrangement with the IHC. Is Icke now in the pay of the very forces he now claims to oppose? Has he been co-opted? Or do Icke’s actions prove that he does not believe what he says? Given Icke’s record of publicly opposing the “Illuminati” in its innumerable guises (and disguises), such suggestions may seem outrageous. But through the act of seeking assistance from the IHC, seemingly without regard to its “reptilian” connections, Icke does much to foster such conspiracy theories. ©2007 Will Banyan. Will Banyan is a writer specializing in the political economy of globalization. His article “The Israel Lobby Controversy” appears in Paranoia, issue 44, and his article, “Neo-Con Counter-Conspiracy?” appears in Paranoia, issue 40. His article, “Outflanking the Nation-State” appears on the Paranoia website, and research papers “The Invisible Man of the New World Order: Raymond B. Fosdick” and “The Proud Internationalist: The Globalist Vision of David Rockefeller” appear at: www.martinfrost.ws/htmlfiles/third_section.html. He may be reached at[email protected]. Cohen, Bonner, “The Price of Doing Business: Environmentalist Groups Toe the Line,” Foundation Watch (Capital Research Center), July 2006. Courtney, Kent & Phoebe, America’s Unelected Rulers, Conservative Society of America, 1962. Gurudas, Treason: The New World Order, Cassandra Press, 1996. Hoar, William P., Architects of Conspiracy: An Intriguing History, Western Islands, 1984. Icke, David, It Doesn’t Have To Be Like This: Green Politics Explained, Green Print 1990. Icke, The Robots’ Rebellion: The Story of the Spiritual Renaissance, Gateway Books, 1994. Icke, …and the truth will set your free: The most explosive book of the 20th century, Bridge of Love, 1997. Icke, The Biggest Secret: The book that will change the world, Bridge of Love, 1999. Icke, Children of the Matrix: How an interdimensional race has controlled the world for thousands of years, Bridge of Love, 2001. Icke, Tales from the Time Loop: The most comprehensive expose of the global conspiracy ever written, Bridge of Love, 2003. Icke, Infinite Love is the Only Truth Everything Else is Illusion: Exposing the dreamworld we believe to be ‘real’, Bridge of Love, 2005.
International Humanities Center, Project Operations Manual, IHC, PO Box 923, Malibu, CA, 2007. Jasper, Willam F., “Conspiracy Realities,” The New American, August 23, 2004. Johnson, Ben “Tides Foundation and Tides Center” (excerpt from 57 Varieties of Radical Causes), 09/04, www.discoverthenetworks.org/. Marcus, George E., “The Making of Pious Persons within Contemporary American Notable Families ” Nelson W. Aldrich, Jr., Sociological Perspectives, (Summer, 1989). Marrs, Jim, Rule By Secrecy, HarperCollins, 2000. Noah, Timothy, “Pathologies of the Idle Rich – Part 3,” Slate, March 12, 2001. Randall, Gretchen & Tom, “The Tides Foundation: Liberal Crossroads of Money and Ideas,” Foundation Watch (Capital Research Center), December 2003. Stang, Alan, The Actor: The True Story of John Foster Dulles, Secretary of State 1953 to 1959, Western Islands, 1968. Strom, Stephanie, “Rockefellers Starting Service for Would Be Philanthropists,” New York Times, April 29, 2002, p.B3. Hone up on your research skills heh? Lynn, this article was written in 2007. What do you think the person that wrote this article is? a psychic? Have never had the inclination to purchase or read anything that Icke has written. As always when watching him orate, he is just another flim flam man making a living on conning people by the gift of gab. Half the crap he spouts is just bs. Disagree. The Draco/Orion Reptillians and their agenda here is well established in the UFO community from personal encounters with them. Reality is in fact a hologram in that every part contains the whole which physics is beginning to understand, and everything that exists is part of one unified field of consciousness that most people refer to as God which essentially is the real message of Jesus (Yeshua) and Buddhism. what about the other half then? Pingback: Ben Fulford: Open battle raging between Sabbatean Cabal and military industrial complex, June 11, 2013 | 2012: What's the 'real' truth? You can stop LOL Lynn. Look at the date next to he copyright at the bottom: the article was written in 2007 and was published Paranoia Winter 2008. It was quite current and accurate then. 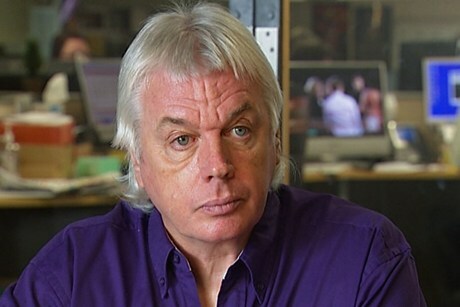 Moreover David Icke made no attempt to publicly refute the article. His solution was to very quietly shut down his ‘Freedom Foundation’. The point of this article, irrespective of the IHC’s recent collapse, is that according to Icke’s own conspiratorial criteria, he should not have been involved with it in the first place because of the Rockefeller and Bronfman links. Yet he was. But lucky him, he got away him time before the IHC pyramid collapsed. I don’t really care where Icke gets his money. I do care that this article is against a reasonable agenda of decentralized regions populated by ecovillages and a reduction in human population. Social ecology is essential. What is more essential is that people, especially women, realize that they are women and support female empowerment as a means of depopulation, along with the sterilization of men. It is the lowest cost way to depopulate and will balance out the androcentric society we have that is nothing more than superchimps in charge. Men are fertile their whole lives and it is less expensive and not harmful to men to have mandated vasectomies after one child or after none. Those be the breaks. Earth is not a sow. Women, please wake up and realize feminism is the necessary way out of this mess. We have to step up and claim leadership instead of being humanity’s junior partners. @Jayne. Mandated vasectomies? Really? You think a governmental body should have the right to force a human to mutilate their self? You are a scary person. I don’t disagree with the empowerment of women. I don’t disagree with many of the points made here. But….There’s always a but lol…I’m not sure which direction yet again this kind of talk is heading?…Humans are useless at seeing the bigger picture. It’s in our nature to be biased and naturally unfair. The sterilisation of men is not too dissimilar to the religious practice of circumcision! It’s a means to an end, pardon the pun. I just think through rules, laws, human rights, centralisation, democracy, member states, nato, blah blah blah and anything which promotes justice etc etc, all the things Icke hates, is the only way…We might see it as an infringement of our civil liberties at times but the bottom line is we all need to be kept in check. We don’t know who we can trust. Probably no-one! Hows that for paranoia.